One of the easiest ways to build up a nest egg is to participate in a 401(k) plan. It’s automatic, it’s easy to set up, and your employer may even give you free money in the form of a company match. Participants can defer taxes until their later years in a Traditional 401(k) or pay taxes now and have tax free income in a Roth 401(k). About 52 million Americans invest in a 401(k) every year. You pay the cost of the investment no matter how good or bad the market performs. There are three main costs in an 401(k) plan. There are the administrative costs of running the 401(k) plan that are paid to the plan administrator, the administrative costs of running the investment that go to the investment manager, and the cost of any fees or commissions that go brokers and salespersons. All of this is why there’s a wide variation in 401(k) costs. You can look at the information about your investment choices to see if there are unnecessary fees you can avoid. If the information is not on the plan website, make sure to request the prospectus, the book that outlines the investment details, to see the investment choices. Look for front end commissions, back end commissions, or 12b-1 fees. If you can make investment choices that avoid these unnecessary fees, you’ll end up with more for your nest egg. If you happen to have an expensive plan, you can ask your plan administrator to add less expensive investment options. You can also switch to a new plan once you leave an employer. But at a minimum, make sure to choose low cost investments within your plan. Let’s say you’re able to contribute $10,000 per year for 30 years to your 401(k). If you earn a 10% return on your investments, you’ll have $1.64 million in 30 years. But if you earn a 9% return because the fund is more expensive, you’ll end up with $1.36 million in 30 years. That’s $280,000 less, all due to 1% more in avoidable fees. It pays to pay attention to costs. When it comes to investments, the higher the returns, the better the investment, right? Most of an investment’s return comes from the type of investment. Higher risk investments like small cap stocks usually have a higher return than lower risk investments like bonds. While some stocks do perform better than others, if you choose based on return alone, you’ll end up with a portfolio full of whatever stock recently performed well. That’s extremely risky. The next time the market crashes or that asset class under-performs, your portfolio will be completely exposed to the downturn. Instead, identify what type of investment it is. Is it a large-cap stock? A fixed income bond? Does it represent a particular industry? Based on this information, you can determine if it has its place in your investments. Some people have a tendency to put a lot of employer stock into their 401(k) because they know it and understand it. This can be quite risky. If your company goes through rough patch, or even worse, goes out of business, you’ll be out of your job AND take a big hit on your retirement plan. If you have more than 10% of your total investment portfolio in your company stock, it’s time to figure out your diversification plan. If you receive stock options or RSUs, start making a plan for those. If you aren’t to choose based on performance, how are you to choose? The best way to pick your investments is to choose according to a boring ol asset allocation. That’s a mix of stocks, bonds, cash, and alternative investments chosen according to your investment goals and risk tolerance. If you keep to your chosen asset allocation over time as the markets change, you’ll smooth out the ups and downs of the market and get the best return for the amount of risk you’re taking. As a first look, a good rule of thumb for an asset allocation is to stick with a mixture of stocks and bonds, with the percentage of stocks being 110 minus your age. If you are 35 and you use this rule of thumb, you would want to have around 65% in stocks and 35% in bonds and cash. Make sure to have a bit of each — stocks, bonds, cash, and alternatives — across many different industries and companies of various sizes. 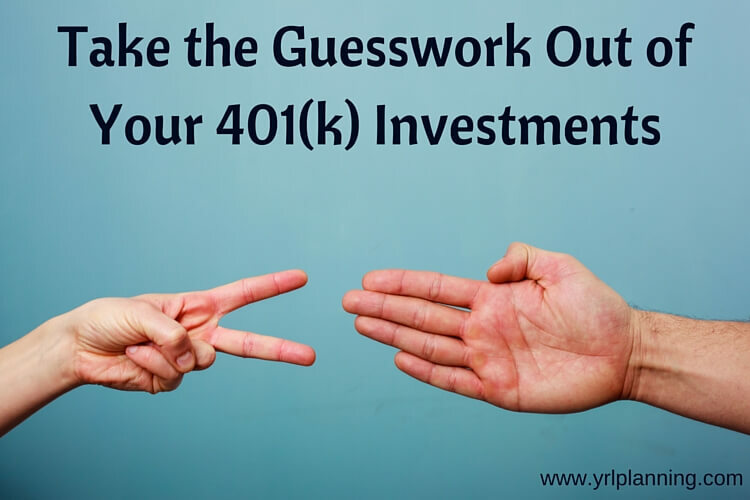 Many 401(k) plans offer a Lifestyle or Target Date fund that will give you an ideal mix of investments and automatically change the allocation of stocks and bonds with time. If the fund has reasonable costs (hopefully less than 1%), this is a simple way to get your ideal allocation and your rebalancing taken care of in one go. If you use a lifestyle or target date fund, there’s no need to add additional funds to the account. You are not adding to your asset allocation. Actually, you’ll probably be tilting it towards a particular industry or asset class, which will make the portfolio less diverse. In general, it’s nice to keep each one of your investment accounts, including your 401(k), Roth IRA, and your brokerage account, to the ideal asset allocation. It makes the job of maintaining your asset allocation much easier. Choosing the right 401(k) investments is important, but it doesn’t have to be complicated. Choose low cost, easy to understand investments according to your asset allocation. But remember, getting started is the most important part of investing. Just start putting money into your 401(k). You can find your ideal investment choices after you’ve begun.